In this article we will talk about top 10 new sharara designs of 2015. This is basically a traditional dress wore in countries like Pakistan, India which have strong cultural values. This trend was inspired from Mughal Empire as it was their tradition. This dress is usually worn by women on weddings as this is a formal wear. The dress can be made from many types of material like chiffon, satin and silk etc. This is the most elegant dress design a girl can wear on her wedding. Many famous designers are working on this design in countries like Pakistan and India and are famous for their bridal wear like HSY, Nomi Ansari, Omar Saed from Pakistan while Ritu Kumar and Manish Malhotra from India. These days this type of dresses are very expensive and girls have to spent more money on their bridal dresses. This style is always in fashion only the style of shirt on these changes from time to time. Nowadays mostly girls prefer to wear designer dresses on their wedding which are very expensive. 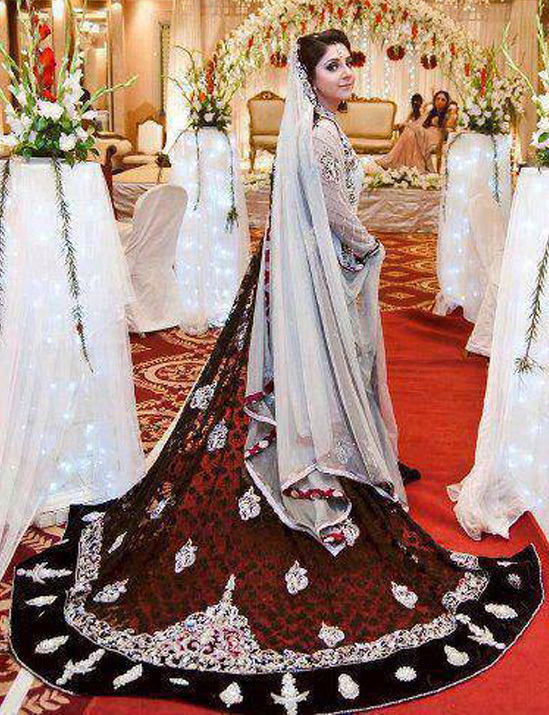 This type of dresses can be worn on mehndi, barat and walima according to your own will. By reading this article you will be able to know about top 10 sharara designs for girls which are in fashion these days. In this dress Sharara is stitched very long which has a tail at the back and is dragged on the floor. On this dress both types of shirt looks good either long or short. Recently some years ago this was in latest fashion for brides but now somehow it is considered as old. But still some brides like to wear this Sharara on their wedding, as it looks very good while walking. Many famous designers have made this style like HSY, Nomi Ansari etc. As in this dress maroon Sharara is on the floor while white color is used for shirt and dupatta. In this three layer lehenga, lehenga has three layers which may be of same color or different colors to make it more attractive. On this dress short shirt is used which enhances the beauty of whole dress. As in picture green dress worn by Reema Khan belongs to the label of Zainab Chottani a famous designer of Pakistan. This was also show cased in bridal couture week Pakistan 2014. This is very latest and unique style of this dress to make it looks more beautiful and royal touch. This latest design usually has lehenga and shirt on it is open. We all know that open shirts are in fashion which is stitched like two shirts one is proper stitched shirt while other is on it that is open. Open shirt is made by two shirts. The shirt under open shirt is normally of plain material and open shirt is more attractive. These days open shirts are very common not only in bridal dresses but casual dresses as well. Mostly designers used open shirt style on lehenga to make something different. The outfit shown in the picture was shown in Bridal couture week in 2014 and its designer was Kuki Concepts. 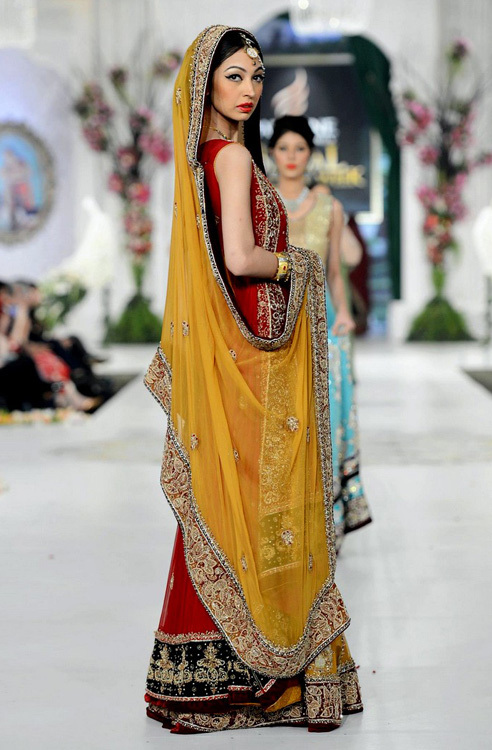 This style of bridal wear is very traditional like women wore this in past like 20 to 30 years ago. This is now again in fashion as a traditional wear. Normally short shirt is worn on this lehenga as it looks more beautiful on this kind of dress. Lehenga is stitched with more material to make it wider to spread on the floor. Frill is on the lehenga to make it looks more neat and beautiful. As in picture Aiza khan was a showstopper has worn this in Bridal couture week 2014 by designer Nikkie Nina to introduce traditional wears again in fashion. This dress looks very attractive on wedding and is in fashion these days. Angrakha shirts were very common on trousers and shalwar but now are the choice for bridal wear too. Mainly two colors are combined to make this dress and multi color choli also looks very beautiful in this dress. As in the picture model Ayyan has worn this dress in bridal couture week 2014 and the dress is of famous designer Mehdi who is very famous for his beautiful dresses. Long shirt is worn with full rounded lehenga which is now the latest style in fashion. This style looks very beautiful on both events like barat and reception. There are many combinations of colors available for this design with very stylish designs and embroidery work. The brides with tall height can add more grace to this dress and looks very elegant. This kind of dress can have both light and heavy embroidery on it. Many famous designers are working to make this style for their customers. Many girls now wore this design on their special day and look very beautiful as shown in the picture. This style of dress is very famous and common these days. In this design shirt on the lehenga is stitched in kind of open coat. Open coat means looks like an open shirt but its look is similar to a coat with a border on it. This looks very elegant and beautiful on brides. This dress is more common in India and many designers there like Manish Malhotra, Ritu Kumar and Sabyasachi are making dresses in this style as they are latest in style. This was an old fashion now again in trend and caught the attention of all the young girls. 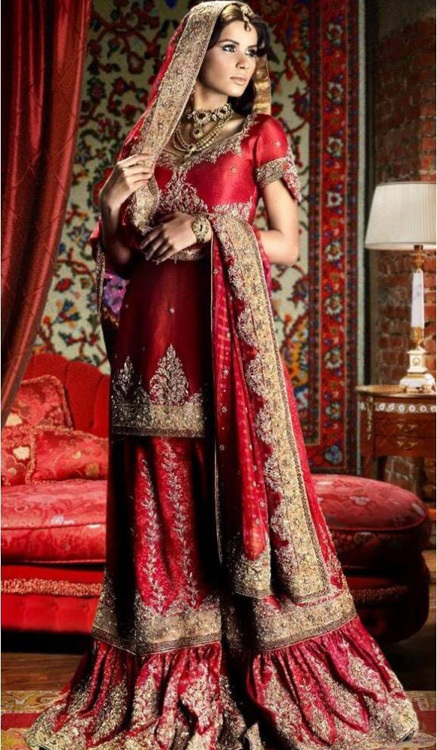 As these days traditional dresses are in fashion so many girls consider this style for their big day. The gharara always looks very beautiful and elegant with short choli. In this style combination of banarsi and embroidered material is used to make this very beautiful. In this style gharara of simple color looks more beautiful than multicolor. By this style girls normally use long dupatta with it to make it latest. Many Pakistani designers HSY, Maria B and Nomi Ansari are making these latest designs for their customers. This is now the latest trend in fashion for the bridal dresses. This Sharara is mostly used and wore on walima and is specially designed for reception. As bridals wear heavy dresses on their wedding so on reception light dresses are used according to the trend in fashion. For this Sharara some colors are specified like light blue, green, light golden, pink and off white are mostly used on reception. As the outfit shown in the picture is also of light color and was shown in Bridal Couture Week in 2014 by the designer Mehdi. This is the most famous and first choice of young girl for their wedding. This outfit is now in fashion from last two to three years. Long shirts with sharara look best for the brides having tall heights. Thin embroidery on the border of sharara looks elegant with dupatta of full length. Sharara with long shirts look very modern and bride look very smart and beautiful in this Sharara. This style was also shown in Bridal Couture Week 2014 by designer Zainab Chottani as shown in the picture. Now latest fashion shows also present this style of Sharara for the viewers. We conclude that all these designs are very common and famous these days among young girls. They always want to wear something special on their wedding so they select something different and elegant. Mostly bridal dresses are very expensive these days. There are many designers of Pakistan and India which are making all these kinds of styles for the brides like Manish Malhotra, Sabyasachi, Ritu Kumar from India, HSY, Omer saed, Nomi Ansari etc from Pakistan. These trends are more common in countries like India and Pakistan because their culture supports these kinds of dresses. We hope that this article will help you to know about latest styles in fashion. Let us know your views regarding Top Ten New Sharara Designs!